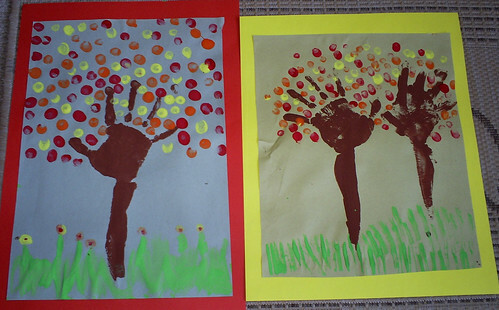 Posted by snoozerider in autumn, home education, kids craft, painting, trees. First of all I painted Waif’s arm with brown paint and he pressed this onto the page to make the tree trunk and branches. At this point Gman declared “yuk! yuk! yuk!” and refused to have his done (he has some sensory issues related to ASD so wasn’t too surprised at this!) Luckily Waif was more than prepared to do more tree trunks – making two trees for his painting. When these had dried, they used fingers to print the different coloured leaves on (Gman was ok with this bit!). Gman painted his grass with a brush and Waif used a piece of cardboard. When they had dried we mounted them on the different coloured card. The idea originally came from the Kaboose website here. There are loads of great ideas there, it’s well worth a look.